Turn it up/off…does music make or break restaurants? We went out for dinner the other evening. The food was brilliant, all fusion noodles and tempura and big Thai curries. Proper South East Asian food that could maybe have had a slightly bigger chilli kick, but I am a Bradfordian, after all. We like our chillis. The restaurant is in one of those converted warehouse-type places with high ceilings and iron beams and leather seats. My mum would undoubtedly have called it ‘trendy’. Everything was first-rate, from the food to the service, except there was one thing, literally in the background, that started to jump out and clobber both of us. The music, which was terrible. on and left it to run through the whole horrifying lot. The problem was the fit. The music didn’t match the food or the restaurant. There was a definite mismatch between the way the restaurant projected itself on the plate and the way it did so over the soundsytem. Bang up to date fusion food vs. cheesy eighties music? It didn’t work out. It needs a little more thought than that. 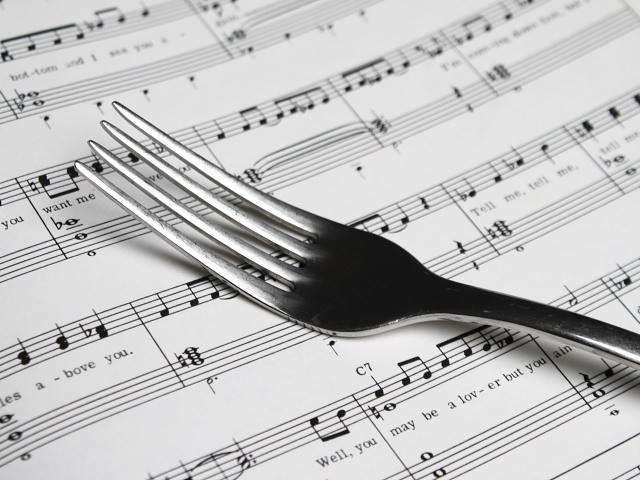 Music should be an intrinsic part of a restaurant’s business plan and its approach to design. There’s a certain French bistro in Leeds that gets it right – it looks like a French bistro, the food tastes exactly like it’s from a French Bistro, and they play French music in the background, all Edith Piaf and the like. They don’t play death metal. That would be wrong (although I’m not suggesting that death metal is always wrong. Some of it is ACE), but Piaf is right in that restaurant, and it rounds off the customer’s impression of a restaurant that’s thought it all through properly and delivered. Just as an aside, and to make one thing clear, I’ll leave any restaurant that plays Coldplay immediately. I don’t find that unreasonable. What of restaurants with no music at all? Happens a lot, and always makes me slightly uncomfortable. A few years ago, we ate in a small, very highly regarded restaurant in a small French town. The dining room had about eight or so tables, and only a couple of them were occupied. The food, wine and service were exquisite, with the waitress/owner letting us sample some wonderful wines that just happened to be open, but the room was cloaked in a deathly hush. We were conspicuously British and therefore the subject of a slightly elevated level of mild intrigue, but the other two tables weren’t particularly talkative, so there was none of the reassuring background chatter that helps you to believe that your conversation is just being lost amongst the ambience. No, it felt as if the other diners were listening right in to every word we said. I doubt they’d have been able to understand us, but that was a minor detail…they might as well have been stood over our table. It was odd and quite uncomfortable. The same thing happened years ago in a Dublin B&B breakfast room, run by a strange elderly woman who wanted to talk about “the troubles” and her dwarf daughter It was all very deathly silent and Twin Peaks-like…I honestly wouldn’t have been surprised by anything at all in that dining room, and I’m certain that the total silence was the main cause of the…creepiness. Now, there are exceptions. Big, bustling, busy dining rooms, places with a natural vibe and a movement and fluidity about them maybe don’t need background music because it wouldn’t serve a purpose. They generate their own atmosphere, and if it works, that’s great, but they’re few and far between. It’s the small places, the places struggling to spark things into life that need to think about this more. There’s nothing worse than a conspicuously awkward meal, and it’s most certainly the restaurant’s job to help you avoid that at all costs. So, what should they play? That’s an absolutely unanswerable question. A restaurant soundtrack should match the restaurant. It could be off-the-wall or obscure, or mainstream and predictable, but it’s got to fit, and it shouldn’t be bad. Now, I know that bad is a very subjective word to use because my bad might be your good, but the choice of music at least needs a little thought put into it. It needs to reflect a sense that the management have thought things through. If it’s good , you might not notice it, but if they get it wrong, you definitely will. It’s not enough to play just anything, or to hit shuffle on a random iTunes library. There has to be a decent stab at a playlist at the very least, and whatever ends up being played out, there must be no easy listening jazz. Why would anybody choose Kenny G when they could have Miles Davis or John Coltrane? Some things can’t be messed with. Obscure isn’t always bad – I was in a cafe in Caerleon where I was very surprised to hear tracks from Basil Kirchin’s ‘Abstractions of the Industrial North’ – which despite it’s title, is actually quite pretty rather than industrial. I doubt any other diners recognised it, but it worked well as mood music. In fact, there may be an argument for stuff that’s not immediately recognisable, even if the genre is. I think the problem is when it’s left in the hands of the cooking / waiting staff on duty (our last Sunday lunch out wasn’t ruined, but was definitely the worse for the music coming out of the kitchen). Don’t know where I stand on that – I feel sorry for anyone who has to work in an environment with piped music (having done it myself, even if you enjoy it the first time, you won’t by the 15th time that week). But is does seem insane to focus only on the visual side of your restaurant. (In fact, when a certain French bistro took over from the previous restaurant, it still had the same plastic bucket chairs and tables – the music was one of the ways they created the atmosphere). In a lot of ways, mainstream stuff is the worst of all, because it’s familiar and your attention is drawn to it because it’s more recognisable. I like the obscure stuff more, anyway. I’ve worked in places with piped music, too. One retail shop in particular circulated one C90 cassette every six weeks, and that was all we could play. I only worked Saturdays, but by the sixth week, I’d be driven half insane by the repetition of it all. In the run up to Christmas, the tape was always diabolical, and they gave it to us a fortnight early. The full time staff had all developed odd nervous twitches by the time the the sales started in January. Next Retail Ltd are solely responsible for developing my total hatred for John Lennon’s solo work. I think in 0rder for the music to be appropriate and effective it should add to the scene without the customer noticing it. It should instantly relax you, make you comfortable, inspire you to the cuisine, whatever – but it isn’t there to make some great point or be loud or be any sort of focus. It should simply be one of those things that creates atmosphere and, thankfully, most places get it right. Though I do agree with you on the “Quiet Restaurant” awkwardness. Don’t get me started on TVs in restaurants though. Its one of my biggest pet peeves. I’ve developed a dislike of background music in most food and drink establishments over the years. I don’t mind companionable silence and believe that if the product served is good enough, it engenders its own special atmosphere. In France, we always find that lunchtime is the best time to eat – the locals all seem to appear at midday on the dot and there is a general pleasant hubbub. I’ve never noticed the need for background music either in France or Italy. I certainly agree about Coldplay – it’s akin to water torture, and not just in restaurants. Great blogs – only just discovered the site today. Outback – Great food awful music-and way too loud!